at the time of membership application. Senior Member fees are pro-rated differently. 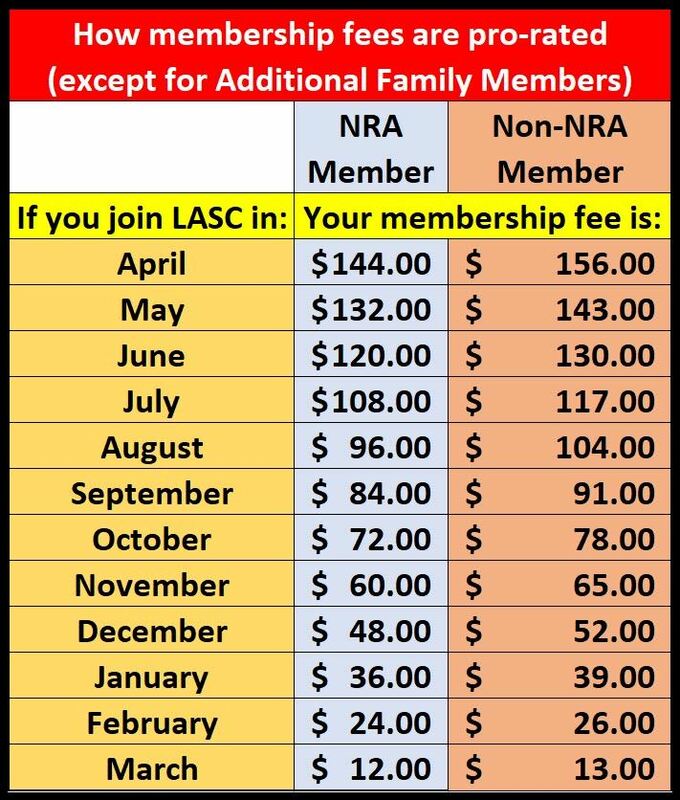 1) NRA Member - $144.00 (USD) Subscription period: 1 year, on: April 1st No automatically recurring payments NOTE: If selecting "NRA Member," you must provide a readable electronic scan (graphic file or PDF file) of your proof of NRA membership (showing NRA number and expiration) via email to membership@la-sc.org concurrent with your membership payment. 3) Senior Member - NRA - $48.00 (USD) Subscription period: 1 year, on: April 1st No automatically recurring payments $48 per year Starting April 1. NOTE: Prorated until July 1. After July 1, dues will remain at $36 for the rest of the member year for new Senior Members who are also NRA members. Must be 70 years of age or older at the time of application. ID and proof of NRA membership required for confirmation at New Member Orientation. 4) Senior Member - Non-NRA - $60.00 (USD) Subscription period: 1 year, on: April 1st No automatically recurring payments $60 per year Starting April 1. NOTE: Dues are prorated until July 1. After July 1, dues will remain at $45 for the rest of the member year for new Senior Members.